Some experts say the construction industry is heading for the perfect storm; a labour shortage on one front, a huge skill mismatch on another and the undercurrent of big cultural challenge drawing the two together. This collision of talent factors could drive productivity down to new lows, and even technology may not be able to save the day. But maybe "talent fit" can. A variety of factors account for poor productivity in construction. And most of them involve people. Poor organisation and inadequate communication for starters - how many projects fall behind schedule or go over budget, or both, because subcontractors, contractors, and owners not having a common understanding of how the project is faring at any given time? And how many projects are burdened with the stacking-up of unresolved issues because of a lack of accountability and contractual misunderstandings? Or afflicted by poor short-term planning (equipment and supplies not in place) and insufficient short-term risk management (the kind that crop up on the job)? And how many projects are doomed because of limited talent management? i.e. not finding the best people for each job. The answer to all of the above is TOO MANY. There are those (mainly those business management consultants hired by tech companies) who will point to a significant growth in productivity driven by technology. These same experts will say that technology will replace a lot of jobs, regular jobs. Not only on the construction site, but even office based workers are in jeopardy and might be replaced by robots, artificial intelligence, big data, or automation. For those experts the question is not if technology replaces some of these jobs, but when, how fast, and to what extent? And it is the third part of that question - the extent - that is arguably the most important thing to consider. Can technology help us avoid the perfect storm? The scientific answer is "it depends." Let's take the automotive industry as an example, because there, more than 40 percent of industrial robots are already working and automation has already taken place. In 1980, less than 10 percent of the production cost of a car was caused by electronic parts. Today, this number is more than 30 percent and it will grow to more than 50 percent by 2030. And these new electronic parts and applications require new skills and have created a lot of new jobs. As a matter of fact, the overall number of people involved in the production of a car has only changed slightly in the last decades, in spite of robots and automation. So what does this mean for construction? Yes, technology will replace many jobs, but we will also see a lot of new jobs and new skills on the horizon, and that means technology will worsen constructions overall skill mismatch. And this kind of de-averaging reveals the crucial challenge for the construction industry. So talent (people) will, with a sense of happy irony, be the big thing in the next decade (not robots). And if humans are the scarce resource, we have to understand them much better. Are they actually willing to work in construction? What are their job preferences? What are they looking for? Contrary to popular misconception, salary is not the number one consideration - actually it probably is not even in the top five. No, what really matters to most people is all about culture; being appreciated for your work, having a great relationship with the people in charge (the boss), enjoying a great work-life balance and having a great relationship with colleagues. Joining the dots between this and a potential solution to the construction industry workforce crisis (labour shortage + huge skill mismatch + big cultural challenge) is not rocket science. In fact, it is VERY OBVIOUS. 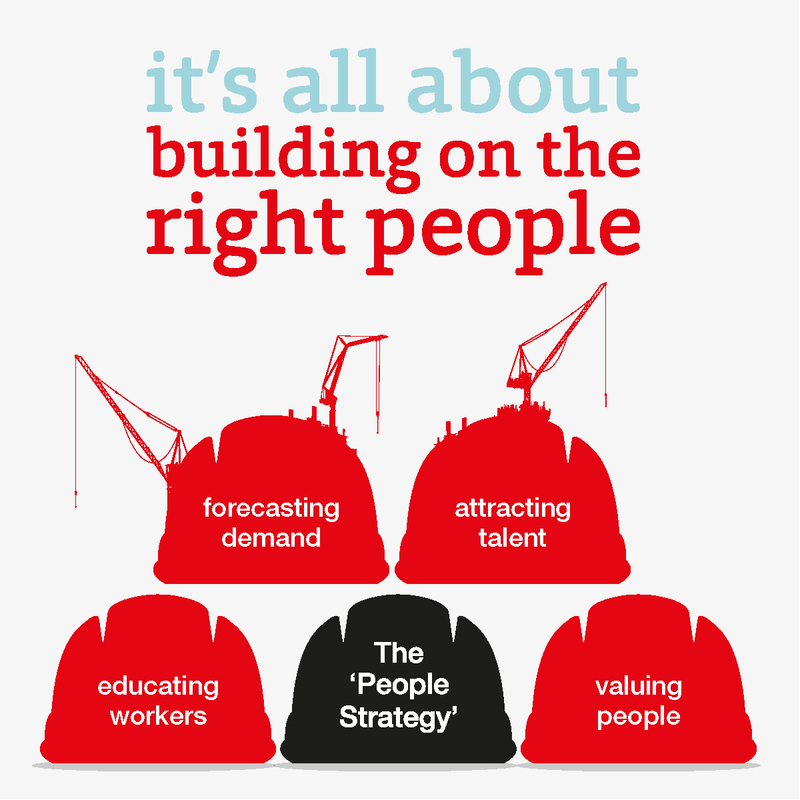 Every company, from subcontracting firms to main contractors to owners (the client) needs a people strategy, and to act on it immediately, and such a people strategy consists of four parts. Number one, a plan for how to forecast supply and demand for different projects and different skills. Workforce planning will become more important than financial planning. Two, a plan for how to attract great people: generation Y, women, but also retirees. Three, a plan for how to educate and upskill them. There's a huge upskilling challenge ahead of construction. And four, for how to retain the best people, or in other words, how to realise an appreciation and relationship culture. However, one crucial underlying factor is to change our attitudes. People are resources, are assets, not costs, not head counts and not machines.